Teeth Whitening Review & Giveaway! Today I am talking about teeth whitening! It is always a process that seems lengthy and never ending but I found a product that is quick and easy. I was asked to try out Smile Brilliant, and without hesitation, said yes. The process for most people is 7-14 applications and you normally start to see results after the first few sessions. I must say I had pretty white teeth to begin so that is why I am thinking I didn’t see a HUGE difference but I did see a difference after my 14 applications. 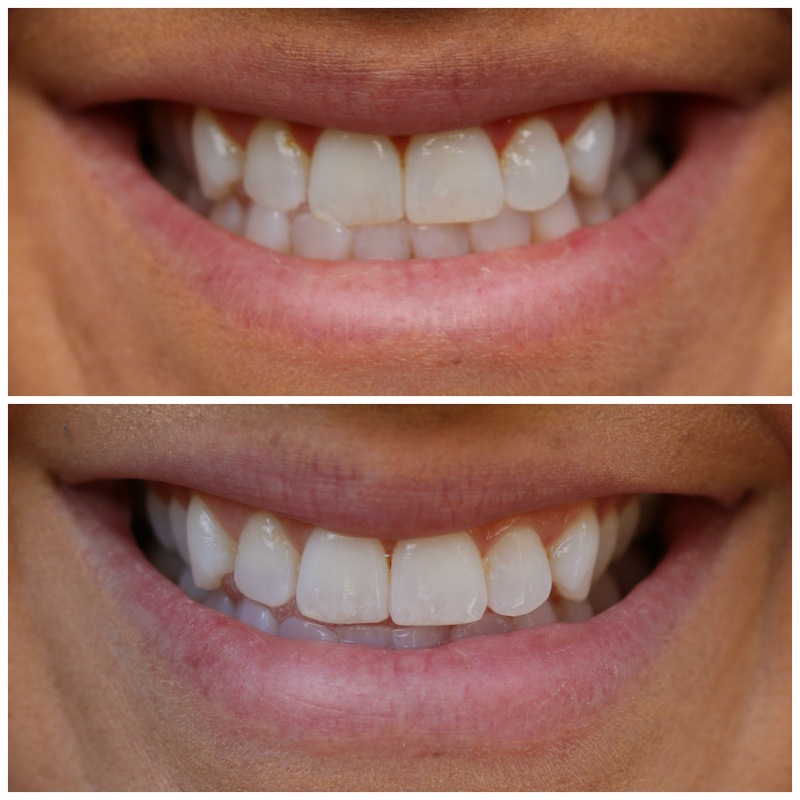 I had hoped that they would be whiter but everyone has different teeth and will have a different experience. Unfortunately, there is no teeth whitening system that will make your teeth as white as a piece of paper, whitening works by removing stains from the teeth, revealing the tooth natural stain free shade. The first few days of the whitening sessions were a little sensitive. I have pretty sensitive teeth anyway and had to start with very short spans of whitening, 30 mins at a time, for a few days, than worked my way up to a full two hours at night. You can keep them in for a few hours if you want but I definitely recommend testing what works for you and any sensitivity you have in the beginning. The product is the same idea as what you get from your dentist. The company will initially send you a kit to make your own mouth impressions. Once you make your dental impressions, you send them into the company and they send you back your custom fitted trays to begin your whitening, it will go by so quick and before you know it you will have sparkly whites! As a thank you to my followers, I am giving one lucky winner a whitening kit from Smile Brilliant! For a chance to win all you have to do is follow the link below and submit your name and email address. The winner will be selected and contacted via email 2 weeks after the post is live. The giveaway is for $139 credit and is open to USA, UK, Canada and Australia. Happy Friday Eve!! I am not going to say happy fall and jinx it because we FINALLY have some cool weather here that I don't want to mess it up, haha! I am so ready for it to really be fall and stay fall. It looks as though this coming week will be it:) YAY! I am so ready to break out my knee high boots and sweaters. I have gotten so many cute sweaters recently that I cannot wait to share with you guys! This dress is one of my favorite from Vici..they have great stuff and always update their site constantly. I am always checking to see what new stuff they have. Also these booties are EVERYTHING. I got so excited about them that I found similar Steve Madden ones in grey and black suede and bought both pairs, you might say I am obsessed. Good morning my beautiful friends and happy Friday! I am currently enjoying my last day at the beautiful beach. It is absolutely amazing here and definitely soothes the soul. This cute little romper was part of the Nordstrom sale a few weeks ago and I snatched it up! Although it is no longer on sale it is still available in all sizes on their website.. its super comfy and light, a must have for sure! Happy Wednesday! I feel like I should for sure have a cowboy hat on with this outfit, haha! These booties are my new favorite. They go so great with jeans, dresses and especially shorts! I would be lying though if I said I wasn't ready fora little cooler weather. You can't tell in these photos but it was literally 100 degrees outside this day and I was trying hard to keep it together and not look a sweaty mess, ha! I don't know if you have checked out Express lately but I am obsessing over all their denim, along with this shirt I also ordered a few pairs of distressed denim, that will be my go to for the fall! Happy Friday love bugs! This is a late post as these last two days have been crazy!! I am so excited to be back to blogging.. I took a break for a few weeks as work just took over. We are in busy season and it got alittle crazy. I feel so much better now that I am back to it and I will have a few new posts for you next week :) Shoutout to my sweet mom for always being ready and willing to help me take these shots. She doesn't know it, but she is a professional in training, haha! Today, I wanted to share this beautiful dress that came from Zaful..I am obsessed with any and all things striped, also the ruffles compliment this dress so well. Not only is this dress the perfect summer find for a date night or day out but it is comfy! Even better than all that is the price on it, today it is only $18.99!! If you need it in a hurry I would also recommend expediting the shipping on it because it is coming from another country, so that can always take alittle longer when having to travel through customs and such. There site has a ton great finds on it all of the items are such a great price!